It was the right sort of day to chug up the Murray or to find a jetty to fish off. Instead we took a Baysport 600 out on the ocean. There was a sizeable swell and plenty of wind to create a nasty sea on top of it; a boisterous day. The most testing weather I have experienced with any of the Baysport family. More than most builders, Baysport produces a genuine family of boats, the unique hull form scaled up and down. 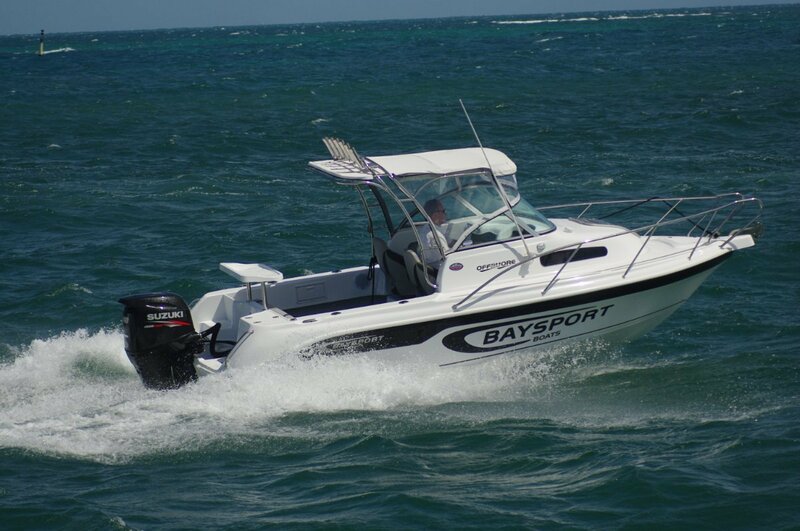 Many builders claim design breakthroughs; Baysport is one that has delivered the goods throughout its range. Practically identical with the behaviour I experienced with other Baysports, it planed at very low speeds and got on the plane without fuss. No excessive bow rise and tail dragging: the hull stayed level and just lifted. Baysport says the concave keel is responsible and I can find no reason for disbelieving. That keel is also the means adopted to reduce the hull’s underwater volume, allowing a 21 degree deadrise but with the chines well immersed at rest. The result is a thoroughly stable platform. The driving position is well protected by clears over the windscreen and a large Bimini. The Targa carrying this provides firm handholds at the sides and the top rear as well as a battery of rocket launchers. Driver and navigator sit on excellent swivels mounted on locker boxes. The navigator’s box extends aft to form a third class seat. The three second class passengers share a settee aft that can fold or can disappear ashore freeing up the cockpit for fishing. Anglers have a drop-in bait board, a tackle drawer, rod holders and a live bait tank. The extended top loading box under the navigator can be used as a catch tank. The review boat had a Lowrance combo sharing dash space with the Fusion stereo that many fishermen claim to be just as vital. More importantly the owner has space and stability; these are the two key items. The fore part of the 600 is close to identical with the other Baysports: a foredeck almost not there merging into a bulbous cabin top. It wastes no horizontal or vertical area and makes the most of the available space. The lack of a permanent bulkhead gives apparent enlargement to both cockpit and cabin, although you would probably want to fit a fabric bulkhead if you installed a toilet in the provided space. The cabin’s interior would remain well lit even with a bulkhead in place with daylight through the clear fore hatch and side windows as well as lights. The bunks are useable but more comfortable for children. With the good headroom the cabin is a good shelter space. 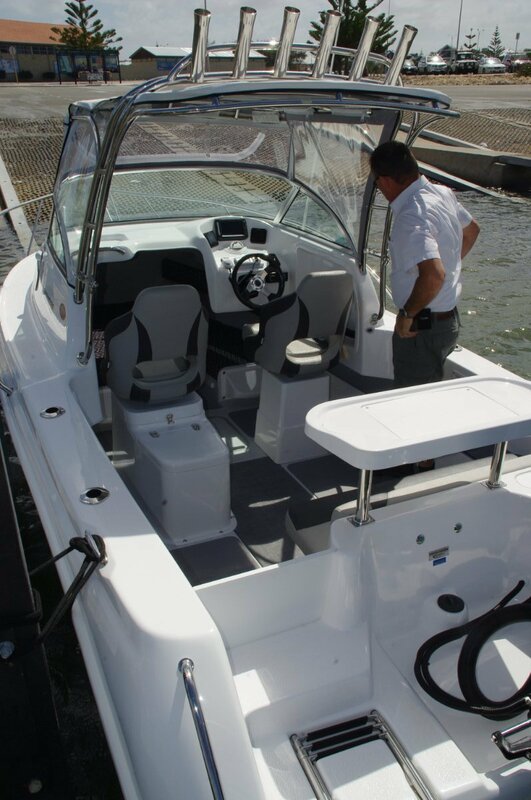 Through the fore hatch is the obvious way to gain access to the foredeck, but via the side decks is practical on this boat. The railings are all within the deck’s footprint, meaning they are not expected to act as de facto fenders. The weather conditions made playing hard irresistible; a 140hp Suzuki gave us the means to do just that. We used far more throttle than the seas suggested and discovered a well behaved, sea kindly boat. We made plenty of spray but not a drop of it hit windscreen or clears. The bow spent a lot of time out of the water but made little fuss when it came back down. A couple of impressive features were its straight tracking and its modest heel in turns. The steering, even downwind, was almost hands off – another characteristic, according to Baysport, due to the hollow keel. Nimble could be the word to describe behaviour and handling.